much of its length with the Dawson Saddle Top US 100 route. Ride 14.2 miles gaining 4,894’ to 5,818’ elevation at 5.9% average grade. This moderately popular bike climb is fully within the Angeles National Forest (established 1908; 655,387 acres; the first National Forest in the state of California). Ride or drive through Azusa on your way to the start 12 miles north. Glendora Mountain Road to the north of Morris Reservoir on drive to our start. This climb begins at the San Gabriel Off Highway Staging Area, which comes with a parking fee charged. Although the area can be very crowded on weekends, during the weekdays (and even some weekends) the traffic is moderate for the first few miles up the mountain and mild thereafter. The first several miles of this climb are unimpressive, but miles approximately 7 to the turnoff to Crystal Lake at mile 11.8 are dramatic, with views back to the south of the big switchbacks just navigated. Upper hairpins - at top of video clip is Crystal Lake area. This first section of the climb from start to the turnoff to Crystal Lake is at 5.5% average grade ascending 3,700'. At about mile 11.8 we turn right and climb the final 2.3 miles at 6.0% grade to the dead end parking lot at the top. 2.2 miles to the top. The Crystal Lake Cafe and Store are about 1.9 miles up the hill from the turnoff at Hwy 39 and serve great grilled sandwiches. 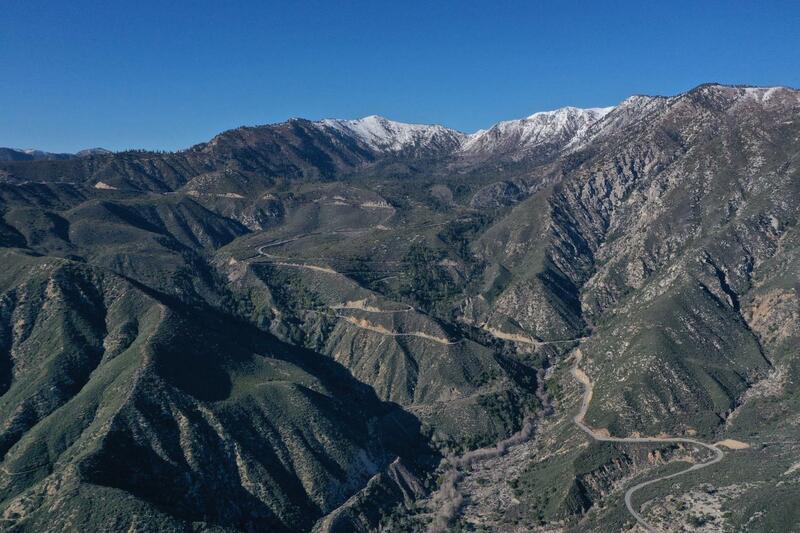 Roadway and Traffic Report: Although the first 12 miles of this climb are on a highway, it is mildly traveled as you ascend towards the switchbacks and canyon several miles from the start. The road for the most part is wide and has a good bike lane and shoulder. After turning onto Crystal Lake Road you will encounter minimal traffic along a well maintained road for the remainder of the climb. Cycling Hwy 39 to Crystal Lake - This bike climb shares its first segment with the more difficult Dawson Saddle climb. Other climbs within a 25 mile straight-line radius of the start of this climb are Hwy 39-Dawson Saddle, Glendora Mountain Road, Mt. Baldy, N4 - Table Mountain, Mt. Wilson, Lone Pine Canyon - Blue Ridge Summit, and Lone Pine Canyon - Table Mountain. Access these other climbs by clicking "Routes in Area" on button below or the climb card above right.